Small, New World monkeys called marmosets can mimic the sleep disturbances, changes in circadian rhythm, and cognitive impairment people with Parkinson's disease develop, according to a new study by scientists at Texas Biomedical Research Institute. By developing an effective animal model that can emulate both the motor and non-motor symptoms of Parkinson's disease, scientists have a better chance of understanding the molecular mechanisms of the neuro-circuitry responsible for changes in the brain during the course of the disease. Scans like magnetic resonance imaging (MRIs) and analysis after dissections may lead to potential targets for new therapies for patients. 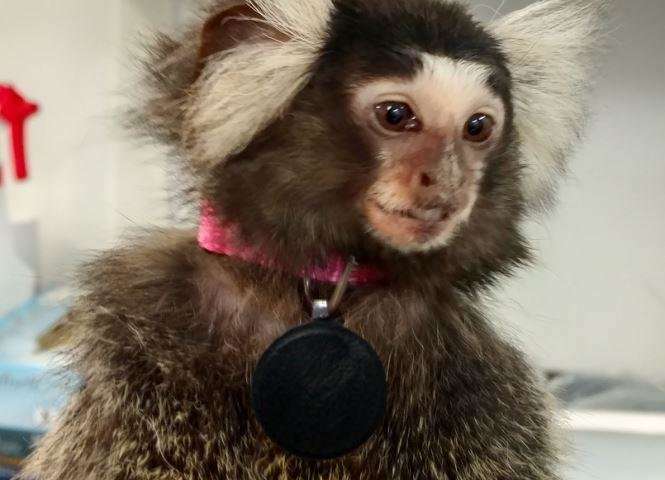 Associate Scientist Marcel Daadi, Ph.D., leader of the Regenerative Medicine and Aging Unit at the Southwest National Primate Research Center on the Texas Biomed campus, is the lead author of the study that tracked marmosets using devices around their necks similar to Fitbits humans use to track their activity and sleep. The study was published in a recent edition of the journal PLOS ONE. In the case of the tiny monkeys, investigators wanted to see if the marmosets with induced classic Parkinson's motor symptoms—like tremors—could also serve as an effective model for non-motor symptoms. In addition, scientists videotaped the animals to monitor their ability to perform certain tasks and how those abilities were impacted over time by the disease. "Most of the early studies in Parkinson's have been conducted with rodents," Dr. Daadi explained, "but there are some complex aspects of this disease you simply cannot investigate using rodents in a way that is relevant to human patients. Nonhuman primates are critical in his aspect because we can see these symptoms clearly whether it is the dyskinesia (abnormality or impairment of voluntary movements), or the sleep disturbances that you can monitor or the fine motors skills." Parkinson's disease affects a million people in the United States and 10 million people worldwide. With the aging population, the incidence of the neurodegenerative disorder is on the rise. 60,000 people are diagnosed with Parkinson's each year in the U.S. alone. The hallmark symptoms of Parkinson's include tremors, slow movements, balance problems and rigid or stiff muscles. However, non-motor symptoms including disorders of the sleep-wake cycle and problems thinking clearly can be just as difficult for patients to handle. "This study is a great first step," Dr. Daadi stated. "More studies are needed to expand on these non-motor symptoms in marmosets in the longer-term, and perhaps, include other nonhuman primates at the SNPRC like macaques and baboons."